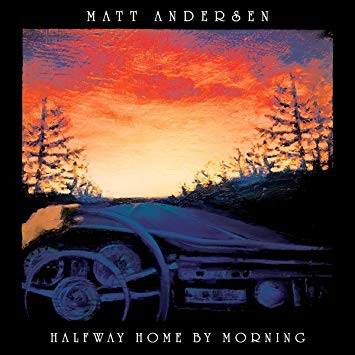 Matt Andersen’s Halfway Home by Morning is a soulful throwback album with an old-school energy that, at times, will remind you of Van Morrison. Andersen’s resonant voice practically purrs. While there’s lots of tasteful instrumentation across the album, from guitar to horns to organ, Andersen’s vocals are front-and-center and the draw of the album. The New Brunswick, Canada native sings with a seriousness and an intensity, but also with a discipline. This isn’t wild soul so much as it’s well-considered. However, the approach pairs beautifully with Halfway’s songs, all of which Andersen had a hand in writing, and all of which feature truly beautiful melodies that are well-served by his meticulous vocal delivery. While Halfway Home by Morning is mostly soul/rhythm and blues, there’s plenty of variation between tracks, which makes sense given that those two genres are fairly big buckets. “What Would Your Mama Say,” the album’s opening track, has a groove a la Wilson Pickett’s “Mustang Sally,” with a nice slide solo that pulls the song in a blues direction. “The Bed I Made” has a Van Morrison vibe, with lovely background vocals from The McCrary Sisters and some in-your-face acoustic guitar work that, like the aforementioned slide guitar, tether the song to rock and blues. The album’s high point is “Something to Lose,” a beautiful duet with Amy Helm, daughter of The Band’s legendary Levon Helm. It’s sweet and intimate, with Helm pushing Andersen to find another emotional gear vocally. There are also amazing horns that are noticeable but not distracting, giving the song an early-60s feel. The song is written by Andersen, Helm, and Ian Janes, but sounds at least 50 years older than that. It’s a great example of the album’s excellent songwriting. “Been My Last” is one of the album’s few tracks that doesn’t draw from soul. This is slow and country-influenced, with pedal steel from producer Steve Dawson that has the sweep and grandeur of an orchestra. There aren’t any horns on the track, but you can almost hear where they might be. It shows a different side of Andersen, who also demonstrates a lot of passion with the vocals. Halfway Home by Morning is well-executed soul with some nice blues and country touches. The production is flawless, as is the songwriting. The album doesn’t have any go-for-the-throat moments of danger, but instead focuses on presenting strong, deliberate performances. For that reason, Halfway Home by Morning might appeal more to soul fans than blues fans, although it handles both genres quite impressively.